Place wild caught salmon filets in a container large enough to hold them in a single layer. 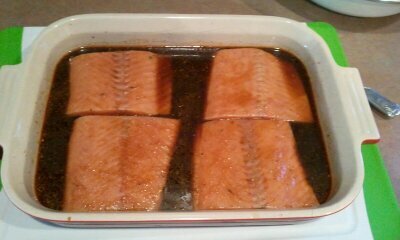 Combine all marinade ingredients and pour over salmon. Let marinate about 30 minutes spooning marinade over the top every 10 minutes. 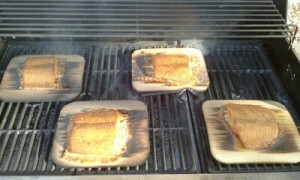 While that is happening, soak your cedar planks in water for at least 30 minutes prior to grill time. For the vegetables, preheat the oven to 400 degrees and line a baking sheet with foil. 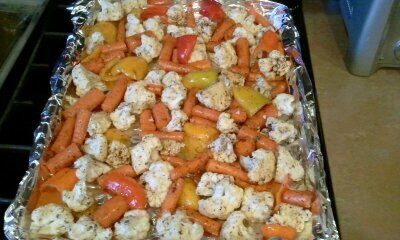 Toss the vegetables with the oil and seasonings and then spread evenly on the baking sheet. Bake in the oven for about 20 minutes or until they reach the level of doneness you prefer. Preheat your grill to high then lower to medium high. 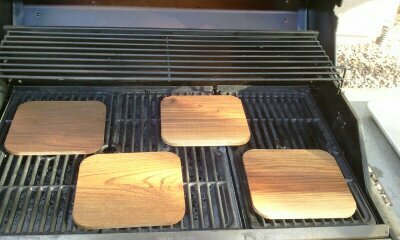 Place planks on grill and close the lid to heat them up. 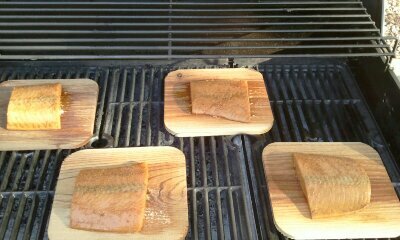 Place your marinated salmon on the planks and close the grill again. For medium well filets, cook for about 6-8 minutes. Plate and enjoy! 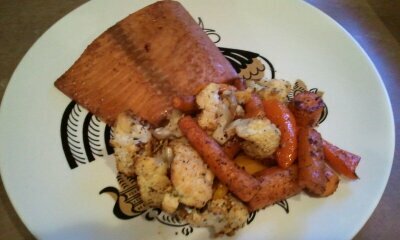 The planks deliver a great smokey essence to the salmon and the vegetables are a great compliment to that with their smokey, chili seasoning! This entry was written by Terese, posted on June 11, 2012 at 1:29 pm, filed under Blog, Paleo Friendly, Recipes, Wild Caught Salmon, Wild Caught Seafood and tagged save money on wild caught seafood, wild caught salmon, wild caught salmon home delivery, wild caught seafood, wild caught sockeye salmon. Bookmark the permalink. Follow any comments here with the RSS feed for this post. Both comments and trackbacks are currently closed.